Most British Columbians expect a few basic things from their provincial government. They want to be able to get a decent job, keep most of their paycheck to spend how they choose, and provide for themselves and the people that depend on them. And they count on government to do what it can to make sure that housing is affordable, that commuting to and from work doesn’t take longer than it needs to, and that child care is available at a reasonable cost. Less than two years after taking power, John Horgan and the NDP government – teamed up with Andrew Weaver and the Greens – are making life in BC significantly more challenging and more expensive. And on their current trajectory, this trend seems likely to get worse before it gets better. Let’s start with taxes: the dollars that come off your paycheque and out of your pocket when you go to the store or fill up your car. The NDP have framed their tax agenda in terms of asking the rich to pay more so that ordinary people can get a break. This might be smart politics, but the reality is a long way from the rhetoric. On the NDP’s watch, BC has achieved the unfortunate distinction of reaching the highest gas prices in North American history – causing serious financial pain for anyone who drives. That’s partly because of supply challenges (more on that later), but the fact that we also have the highest gas taxes on the continent – up by 32 cents in the past year alone – doesn’t help either. Neither did Premier Horgan shrugging off the BC Liberals’ call to ease off gas taxes to provide drivers with some much-needed relief. A big part of that gas tax burden is BC’s carbon tax – a measure to combat climate change that many British Columbians support. The trouble is that the NDP government has eliminated a key feature of that tax – the BC Liberals’ revenue neutrality guarantee, which ensured that every dollar you paid in carbon tax was given back through reductions in other taxes. On the NDP’s watch, this tax will continue to rise and make everyday life less affordable. 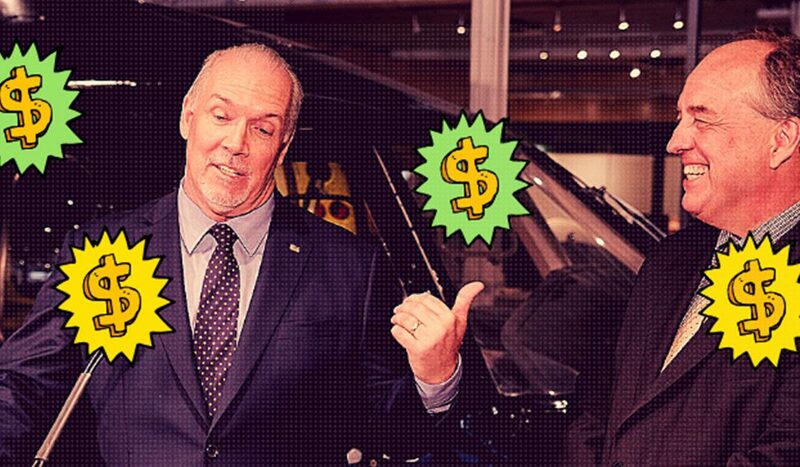 John Horgan has blamed high gas prices on supply and demand, and he may be partly right. But his own party’s aggressive campaigning against the Trans Mountain pipeline expansion project – which helped force the purchase of the project by the federal government, funded by taxpayers – is one of the most significant causes of that issue. Producers’ inability to get Canadian energy to the Pacific coast through pipelines has contributed to the gas supply crunch in BC – and another consequence is that more oil is travelling through BC communities on trains than ever before. In fact, oil-by-rail traffic – much less safe than pipelines – has increased by eight times since 2012. Rising gas and carbon taxes aren’t the only reasons driving is getting more expensive. Since the NDP formed government, basic auto insurance rates have risen by over 14% — which means that the average driver’s rate is now around $1,740 – the highest in Canada. Recognizing that these kinds of rate hikes are unsustainable, the BC Liberals have proposed fundamentally transforming the auto insurance market to allow more consumer choice and improve affordability for drivers. But the NDP seem content to fiddle around the edges of ICBC, imposing band-aid solutions that do little to improve affordability. With all of these cost pressures, nobody could blame you for choosing you to leave your car at home. So what options do you have for getting around? Every other major jurisdiction in North America has opened up to ridesharing services like Lyft and Uber, which allow you to request a ride through a smartphone and provide helpful income to part-time and full-time drivers alike. The NDP have broken an election promise to bring ridesharing to BC by Christmas 2017, and are even moving BC further away from this goal that has broad support in BC communities. And the Greens haven’t lifted a finger to stand up for British Columbians in need of better transportation options. Car, taxi, bike, or bus – even the roads, bridges, and tunnels we travel on are set to get more expensive if the NDP get their way. The Horgan-Weaver government have made dramatic moves to ensure that taxpayer-funded construction projects will be built entirely by union labour. But above and beyond that, these projects will only go to the NDP-friendly unions in the BC Building Trades – which represent less than 15% of BC’s construction workforce. You read that right. 85% of BC construction workers could be excluded from these projects unless they join an NDP-approved union. It’s a blatant pay-off to the NDP’s political friends – and even more offensive, this move is set to drastically raise the costs of public construction projects. That extra money, counted in the billions, will come out of your pocket – and this policy will reduce government’s ability to invest in key infrastructure. That means worse gridlock, more time spent on your daily commute, and real dangers to public safety – like the seismically unsafe Massey Tunnel bottleneck that the NDP government is refusing to replace. Few issues in recent years have produced as much passion, controversy, and concern as housing affordability. The NDP have talked a good game on these challenges, but their actions haven’t kept up with their words. In fact, many of their decisions risk making housing in our communities even more scarce and expensive. Take the so-called speculation tax, designed by the NDP to drive a wedge between British Columbians living in homes assessed at a high value and those who aspire but are struggling to become homeowners. NDP policies have only hurt both groups, while doing little or nothing to stop actual real estate speculation. Take the example of Goat’s Peak – a 1,000-home residential development in West Kelowna that has ground to a halt as a result of the uncertainty caused by the NDP. Not only has the stall put hundreds of good local jobs at risk, but the lack of additional housing units means more pressure on limited local housing supply. That means higher rents and home prices. For evidence that the “speculation tax” is all about politics, not people, consider that the NDP refused to even consider the BC Liberals’ proposed flipping tax that would have actually tackled rising condo prices. And for those feeling squeezed by high rent, there’s no sign of relief under the NDP and Greens. The NDP’s promised $400 renter rebate can be added to their long list of broken promises. But one of the most destructive NDP tax policies could be the new Employer Health Tax. While the BC Liberals campaigned on a plan to eliminate the Medical Services Premium (MSP) without raising any other taxes, the NDP are simply replacing MSP with this new payroll tax that will have serious consequences for British Columbians at every income level. With the NDP double-dipping to collect both EHT and MSP in 2019, BC employers are facing double trouble. For example, Ocean Trailer in Delta is facing a combined tax hit of $325,000 this year. This will force local businesses large and small into tough decisions that could include letting employees go, delaying or cancelling new hires, and passing the additional costs on to their customers – making EHT a tax on everything. And for the many British Columbians whose employers were already paying their MSP premiums, there will be no direct financial benefit to balance out the negative impacts. That’s especially true because the EHT hammers public sector employers including municipal governments, health authorities, and school districts. Those hefty tax bills will squeeze the budgets of cities, schools, and hospitals – and result in higher property taxes for homeowners and employers. Some might argue that higher taxes enable stronger public services – but there’s no sign of that under this NDP government. For example, the NDP’s approach to child care shows every sign of falling far short of their extravagant campaign promises. A recent survey of BC child care providers suggests NDP policies could result in a loss of more than 8,000 spaces throughout the province. So far, the NDP have been big on empty slogans and short on actual improvements that make life better for working families. Not quite two years into this NDP government, the evidence is clear: life in BC on their watch is getting more expensive, less convenient, and more unpredictable. British Columbians are paying higher taxes, getting less for money for their money, and being pitted against each other by a government that’s more interested in politics than people. BC can once again become a land of opportunity, with a premier and a government that want to see more British Columbians get ahead and be rewarded for their hard work. A government that believes in opportunity for all of BC. Do you agree? Click below to SHARE this post with your network. For me the turning point is the arrogance displayed by the NDP whereby they expect ALL households in the speculative housing tax areas to prove they are not speculators. They even admit that 99% of all households will be exempt, but we are ALL still forced to apply for an exemption from the additional tax EVERY year… UN effing believable. If you promise to get rid of the speculation tax for BC born and bred home owners then you have my vote. Been listening to the construction association ads that tell us how excessive the costs are going to be for public projects limited to union operated company bids. Has anyone in the liberal party done the research on the extra cost we will bear because of these NDP designations? Has anyone thought of challenging their decree in court When a government intentionally wastes taxpayers’ money, then it has to be challenged.